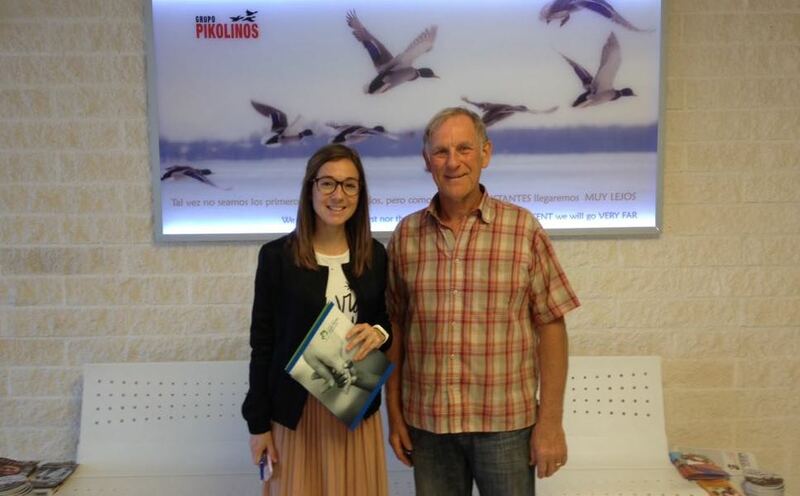 Fundación Juan Perán – Pikolinos spokeswoman Isabel Marco Soler with Easy Horse Care co-founder Rod Weeding. Twelve stunning photographs of horses, ponies and donkeys rescued from abuse and neglect feature in a new 2018 calendar launched by Spain’s Easy Horse Care Rescue Centre this week. 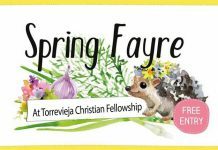 The non-profit Rojales rescue centre – which on Saturday saved yet another abandoned and severely skeletal pony, the fourth such rescue in just one month – hopes the calendar sales will help raise funds to buy a much-needed second-hand mini digger. The centre’s previous digger, an aging model donated second-hand almost a decade ago, finally broke down irreparably last month. Since then, Easy Horse Care co-founder Rod Weeding, a 68-year-old British expat, has been digging knee-deep footings for new boundary fencing by hand. 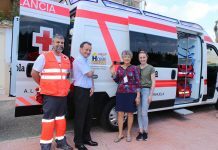 The centre hopes to raise €12,000 to buy a second-hand replacement – and was astounded to receive a major donation from Elche’s Fundación Juan Perán – Pikolinos to kick-start the mini digger fundraising campaign. 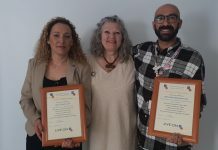 “We had the opportunity to go to the rescue centre and meet the animals that live there and the truth is that the Weedings work extremely hard, have sacrificed a lot and deal with very high expenses,” said Isabel Marco Soler, a spokeswoman for the foundation. 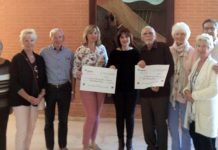 Fundación Juan Perán – Pikolinos has also part-sponsored printing of Easy Horse Care’s new calendar, which features photos of six horses, three donkeys and three ponies kindly taken and donated by photographer Elaine Warnock. The limited-edition calendar was designed by volunteer Koren Helbig, meaning almost every cent raised from sales goes straight to the mini digger fund. The calendar costs just €15 and can be purchased at Easy Horse Care’s monthly open day or online (for delivery or pick-up from the centre’s charity stores) here: easyhorsecare.net/shops/online-shop/calendars/2018-rescued-equine-calendar/. Donations can also be made directly to the mini digger fundraising campaign here: easyhorsecare.net/donate/mini-digger. 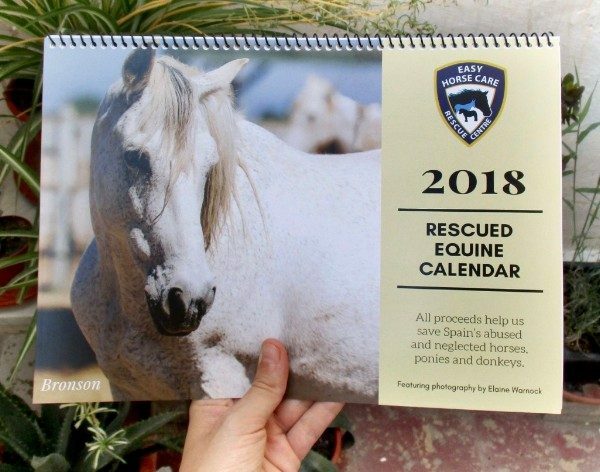 The calendar launch came after Easy Horse Care’s August 5 rescue of yet another terribly thin pony, which had been abandoned in a small and rubbish-filled wire enclosure for 11 days near Cartagena. Local police at first called Andrea’s Animal Rescue, which removed the pony but did not have the space to house him, and so called Sue and Rod Weeding. 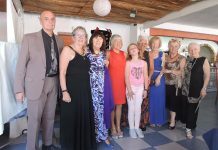 The Weedings immediately agreed to assist, despite already having 106 rescued horses, ponies and donkeys in their care. “He is absolutely skeletal, has terrible teeth, fungal growth on his coat and anaemia from malnutrition, and a very strange gait through his hind legs – we will need to take x-rays to determine what’s going on there,” Sue said. 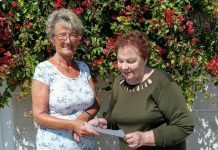 Easy Horse Care Rescue Centre relies entirely on donations to fund its important animal welfare work. Good-quality furniture donations are currently sought for the centre’s charity stores, which are low on stock. Anyone interested in making a donation or volunteering can call Sue on 652 021 980. Located just outside Rojales at Partido Lo Garriga, 59, the Easy Horse Care Rescue Centre opens to the public on the first Sunday of every month between 1pm and 4pm. Visit www.easyhorsecare.net and follow us on Facebook at @EasyHorseCare.